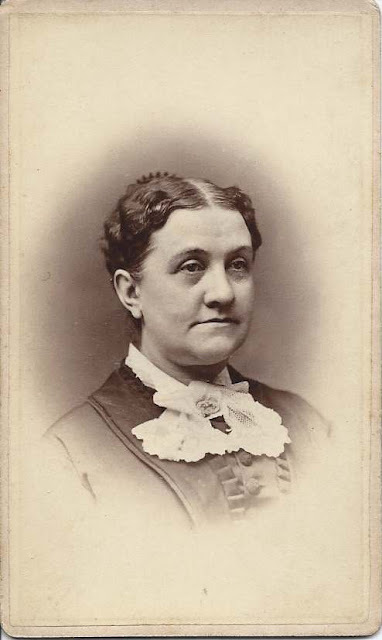 Carte de visite of a woman identified on reverse as Mary Sophia Truesdell Merrill. 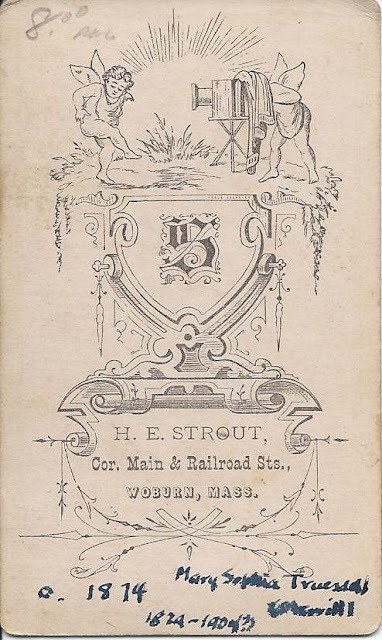 The CDV was made by the studio of H. E. Strout, located at the corner of Main and Railroad Streets in Woburn, Massachusetts. The birth and death years on the CDV are at odds with what I found online. Mary Sophia Truesdell was born 30 November 1829 at Somers, Connecticut, the daughter of Ozias and Esther (Hall) Truesdell, who were born at Wilbraham, Massachusetts, and Somers, Connecticut, respectively. Ozias' mother was Rhoda Trusdell, daughter of Thomas Truesdell, Jr. and Rhoda (Curtis) Truesdell. It appears that Ozias was born out of wedlock. Rhoda later married Nathan Warriner, but I'm not sure he was the birth father of Ozias. Mary Sophia's maternal grandparents were Josiah Hall, Jr., and Esther (Dwight) Hall. On 2 November 1855, Mary Sophia became the second wife of Reverend Charles Atwood Merrill, son of John Tappan Merrill and wife Deborah (Atwood) Merrill. He was born 20 April 1826 at Woodstock, Maine. Charles studied at the Biblical Institute at Concord, New Hampshire, and pastored at several Massachusetts churches, including at Springfield. See a photograph of Charles A. Merrill here. If you have corrections to the information above or insights into the Truesdell and Merrill families, please leave a comment or contact me directly.